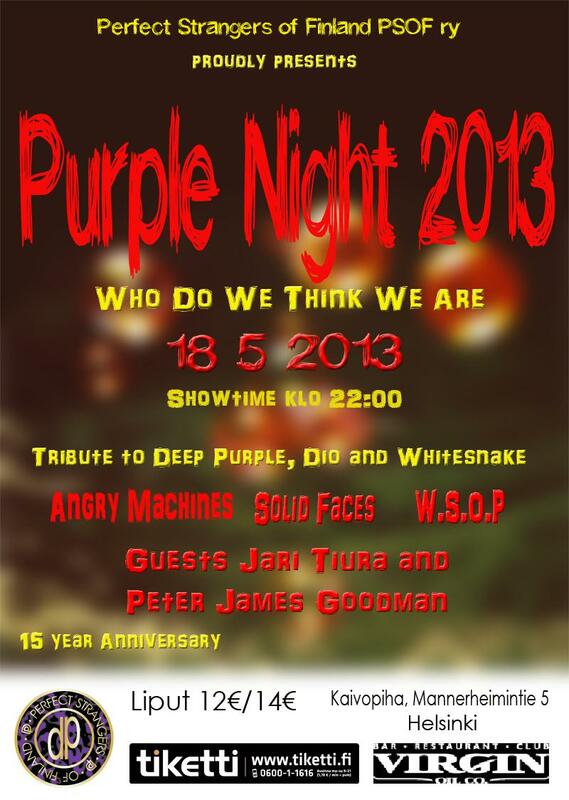 Perfect Strangers of Finland is celebrating their 15th anniversary by organizing a traditional Purple Night concert. Who Do We Think We Are will be the theme for this Purple Night, which is being held for the fifth year in a row now. Solid Faces (Pietarsaari): the band that toured with Doogie White in 2009. They will perform a set of Purple covers. Angry Machines (Oulu): will perform a set of Dio, commemorating 30th anniversary of Holy Diver. 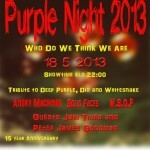 White Shade of Purple (Kouvola): will play mostly music of Whitesnake. Guest singers for the night will be Jari Tiura (e.g. Former Michael Schenker Group, Stargazery) and Peter James Goodman (e.g. Conquest, Purple Society). When: Saturday, May 18, 2013, from 9pm — 4am. Where: Virgin Oil, Kaivopiha, Mannerheimintie 5, Helsinki, Finland. Posted by Nick Soveiko on Monday, April 15th, 2013, filed under Blog. You can follow comment on this post through the RSS 2.0 feed. You can leave a comment below, or trackback from your own site.